NHL News : Breaking: P.K. Subban sets an example for all the anthem protestors. Breaking: P.K. Subban sets an example for all the anthem protestors. Incredible move by P.K. Subban. There have been a bunch of millionaire athletes protesting the national anthem as of late across a number of sports in North America, but one athlete who made it clear he would "never" kneel may have just raised the bar for each and everyone of those athletes. Regardless of what side of the issue you may fall on, it's clear that the national anthem protests have achieved nothing but creating more division and now rather than protest the anthem, Nashville Predators superstar P.K. Subban will be working to bridge that divide. 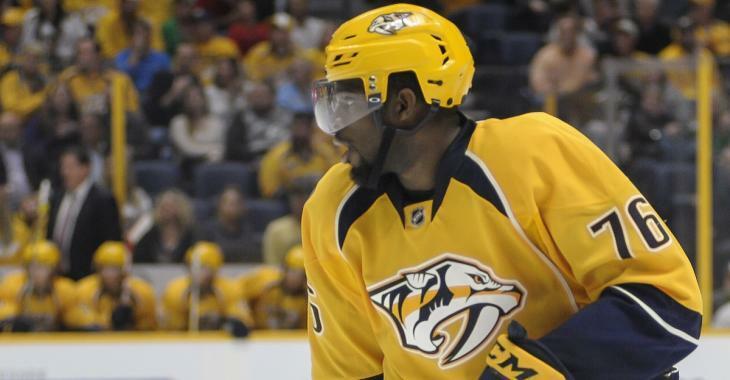 During every Nashville Predators home game this season, Subban will host his new P.K. 's Blueline Buddies program, bringing together a member of the Metro Nashville Police Department and their guest with a mentor or representative from a local organization and an underprivileged youth. Subban takes care of the game tickets, dinner and meets with the group prior to and after the game to lift their spirits and give them a few hours to forget about everything on the outside. Rather than using some kind of symbolic gesture or venting his frustration in the media, Subban is letting his actions speak for him. Much like when he made a massive commitment to the Children's Hospital in Montreal, Subban is setting a high bar for other professional athletes to aspire to. "I think it's important for athletes to set a tone in a way that we're looking to build bridges," Subban said. "That doesn't take away from anybody's right to do what they want to do or how they want to exercise their rights as an American citizen, but I think it's really important for us to be role models in terms of building bridges and being a part of the solution to social issues and different things that go on in our community." Regardless of what team you may cheer for, it's hard not respect a man who is using his influence to try and do good in the world.